You too can grow mushrooms at home. It’s easier than you think! Buy a mushroom cultivation kit: If you are a beginner, buying a kit really helps you get a feeling for how mushrooms grow. See our Cultivation Supplies links page for kits. Purchase spawn: From a local or online supplier and inoculate your own substrate, for example straw. This part is easy. Make your own mushroom cultures and spawn: This is challenging. You will need a sterile workplace and a means of sterilizing agar and grain. For a sterile work area you will need glove box or for sterilization you will need a pressure cooker or autoclave. Oyster Mushrooms are the easiest species to grow. Beginners should start with Oyster mushrooms. 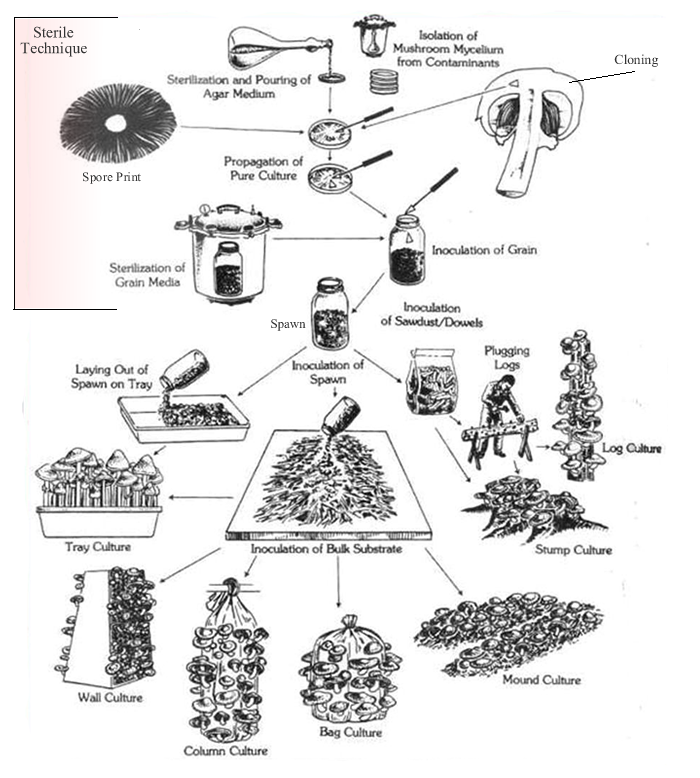 Obtain a culture started from spores (e.g. a clean spore print) or by cloning a fresh mushroom. Beginners should proceed to step 3 and purchase ready-made spawn from a supplier. Obtain spawn for your species of choice. Purchase spawn from a mushroom cultivation supplier. Decide what material (called the substrate) that you want to grow you mushrooms on. See page on Commonly used substrates. Treat your substrate of choice. Treatments include pasteurization, sterilization, lime bath, peroxide bath and "cold fermentation." See page on Preparation of Substrates. Inoculate your substrate with the spawn. When the little mushrooms (called “primoidia”) first appear (called pinning), put the substrate with primoidia in an environment with the recommended conditions to promote fruiting. This will mean controlling temperature, light, humidity, and air flow that your chosen species likes. Harvest your mushrooms! Ideally, just before spores are released.